Each course is held in a high quality central city hotel venue. In London, the courses will always take place in hotel venues that are within a short distance of a major Central London tube station. In other cities the courses take place within a short distance of a major mainline railway station. Yes, lunch is included for delegates on all courses that span the lunch period. Can we pay for the training course by credit/debit card? Is a discount available for multiple delegates attending the same course? Yes, discounts are available for multiple delegates attending from your organisation on the same course, on the same date, when booked at the same time. 10% discount is available for the 2nd delegate, and 15% for each of the 3rd and subsequent delegates. Are your courses available on an in-house basis? Yes, each of the courses can be supplied to your staff at your own premises or at a venue of your choosing. We can also tailor a course, or create a new course, to suit the needs of your staff. Please contact us for more information and see the In-House Training FAQs below. Please see the Terms & Conditions for information on course cancellations. What happens if PDP cancels a course? PDP rarely cancels courses. Where we do so it is due to circumstances beyond our control. Where this happens you will be given as much notice as we can supply (usually at least 10 days), and you will be able to choose between re-booking the course for a later date or a full refund. 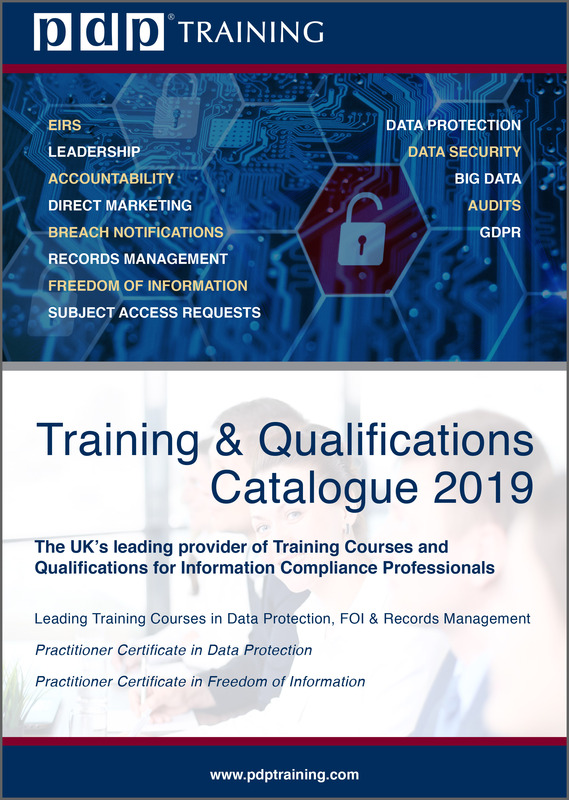 I have already attended one or more of the courses that comprise the Practitioner Certificate in Data Protection or the Practitioner Certificate in Freedom of Information. Can I use these courses as credit towards gaining the Certificate? Yes, please see the Qualifications section below for more details. Yes, each of the courses can be supplied to your staff at your own premises or at a venue of your choosing. We can also tailor a course, or create a new course, to suit the needs of your staff. Please contact us for more information. Can the course be tailored to suits the needs of my organisation? Yes, we can tailor a public course to suit the particular needs of your organisation. We can also design a new course to meet the specifications that you require. What are the fees for in-house training? Please contact us so that we can give you a quotation. We will need to know your location, the type of course that you require, the preferred duration for the course (e.g. half-day, full day) and the approximate number of delegates. Does the fee include entry into the Examination? Yes, the fee is fully inclusive of tuition, all study materials and the Examination. I have attended some of the required courses before. Will I be able to use those towards gaining the qualification? Yes, any of the Compulsory or Elective courses that you have attended in the twelve months prior to your enrolment on the Practitioner Certificate Programmes can be used towards completion of the Programme. Is there a time period within which the courses must be taken? Yes, the courses and examination must be completed within two years of enrolment. Although it is not necessary to attend the courses in any particular order, you may find it helpful to attend the Level 1 course before attending the Level 2 course. If you are new to data protection, we strongly suggest that you attend the Levels 1 & 2 courses before attending the remaining three courses. Can I get a discount on the Programme Fee if I have attended any of the Compulsory or Elective courses before? Yes, a discount of £300 / €325 / $400 will be applied to your Programme Fee for each relevant course that you have attended previously. Please let us know, at the time of your enrolment, that you have already attended relevant training courses. If I have attended all of the courses, but not yet enrolled on the Programme, can I sit the Exam? Yes, where you have already completed all relevant courses, you can enrol on the Programme for the fee of £695 / €755 / $895 plus VAT. You will then be sent the additional reading materials, and you can sit the Exam on the next available Examination date. Is a discount available for multiple delegates enrolling on the Programme? A discount of 10% on the Standard and Residential Programme Fees is available for each additional candidate from your organisation enrolling at the same time. How can I be exempted from attending the Data Protection Essential Knowledge – Level 1 course? Candidates who have worked in the field of data protection for at least two years are not required to attend the 'Data Protection Essential Knowledge – Level 1' course when completing the Practitioner Certificate in Data Protection Programme. 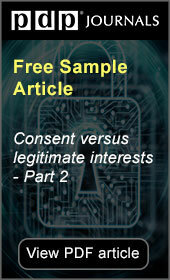 Candidates wishing to apply for the exemption must submit a letter signed by their current or previous employer attesting to their having worked in the field of data protection for at least two years. How long is the exam, and what is the format of the exam? On the Practitioner Certificate in Data Protection Programme, the exam is 3 hours in duration. On the Practitioner Certificate in Freedom of Information Programme, the exam is 2.5 hours in duration. Each exam is composed of two parts: a paper consisting of multiple choice questions and a paper containing longer form questions which require written answers. Can the Programme be taken as an in-house course? Yes, organisations with several candidates (a minimum of 6) to enrol on the Programme can have the training courses take place at their own premises. Please contact the In-House Team for further information. Please note that the Examination must be taken in London (or Glasgow for the Practitioner Certificate in Data Protection) by all candidates. What does "PC.dp." and "PC.foi." mean? The designation “PC.dp.” can be used after your name to show that you have completed the Practitioner Certificate in Data Protection Programme and passed the examination. The designation “PC.foi.” can be used after your name to show that you have completed the Practitioner Certificate in Freedom of Information Programme and passed with the examination. Is there a requirement to keep my qualification up to date? Yes, the GDPR requires that data protection practitioners update their knowledge on a regular basis. Therefore as part of your obligations as a data protection professional, the Examination Board has determined that you are required to keep your PC.dp. qualification up to date. From the first anniversary of your being awarded the qualification, you are required to attend at least one ‘designated course’ per annum. The relevant courses are designated by the Examination Board. The currently designated courses are ‘Accountability and Data Protection Policies’, ‘Breach Notifications’, ‘Complying with the Rights of Individuals’, 'Cybersecurity for Data Protection Professionals', ‘Data Protection Act 2018 – Understanding its Implications’, 'Direct Marketing - The Legal Risks & How to Overcome Them', 'Profiling and Big Data' and ‘How to Conduct a Data Protection Audit’. Further training courses will be added to the designated list from time to time. You may also attend the first day of the Annual Data Protection Compliance Conference. Can I re-sit the Exam if I do not pass it? Yes, you can apply to sit the Exam a further two times (three times in total). After this, the Programme will need to be taken again. The fee for re-sitting the Exam is £290 / €375 plus VAT. Yes, all candidates who pass the Examination will be sent a certificate by post within two months of being notified of their result. Can I change the exam date once I have booked? Yes, you can defer the date of the Examination that you have booked any time up to three weeks prior to the Examination date free of charge. Requests for changes received after that date incur a fee. For a list of fees, see the Terms page. If I lose my certificate, can I obtain a replacement? Yes, there is an administrative charge of £25 for a replacement certificate. Is there any difference between the tuition on the Residential Programme and the regular one-day training courses? There is no difference in the tuition. Having the courses taught only to qualification candidates in a residential setting allows the whole Programme to be taught over four days. Is there any difference in the trainers? No. The trainers that teach the one-day courses at various locations throughout the UK will also teach the candidates on the Residential Programme. How many days will I need to take off work? The tuition portion of the Programme runs from Wednesday to Saturday inclusive, so you will need to plan to be away from work for three standard working days. If I have attended any of the courses before, can I be exempt from parts of the Residential Programme? No. The Residential Programme is designed as an intensive training package, which must be attended in full. Candidates are not permitted to select parts of the Programme to attend. Any candidate that has booked onto the Residential Practitioner Certificate in Data Protection Programme may cancel that booking at any time up to eight weeks before the date of the commencement of that Residential Programme – such cancellations will incur an administration charge of £250 plus VAT. No refunds are available for a cancellation that is received by PDP after eight weeks prior to the first day of the Residential Programme on which the candidate is booked to attend, and any invoice that is outstanding remains payable in full – however, the candidate may transfer to a future date for the Residential Programme for the transfer fee of £500 plus VAT, if more than two weeks’ notice is given. Within the two weeks prior to the start of the Residential Programme, no transfer will be available. Is there a deadline to enrol? There is no deadline to enrol. What is the recommended timeframe for taking the Exam after enrolling? The time that you take to study the materials will depend on how much time you have available, bearing in mind your other commitments. In many cases a period of three months might be sufficient to study the materials and prepare for the exam. Do I have to attend a particular place to take the Exam? No. You can take the exam from your home, office or wherever you wish. You will be given a secure access code to log in to the examination website. You can choose a suitable time to take the exam. Once you have commenced the exam, you will have 2 hours of total online time in which to answer the questions. How many times can I re-sit the Exam? Should any candidate fail the examination, the examination can be re-taken twice more (a total of three times). Can I start the learning process as soon as I have enrolled on the Distance Learning Programme? As soon as you enrol, we will send you an invoice for the Programme. Your study materials will be sent you as soon as payment is received.